The Buffalo River Safe range has been designed to provide Hunters, Sportsmen and collectors with a functional and attractive security option for their firearms. With a choice of three series in the range you are bound to find the option that satisfies your particular laws or safekeeping requirements. Safe keeping of firearms whether it be from Children or those with no permission is a serious matter that all firearm owners must consider when owning firearms. 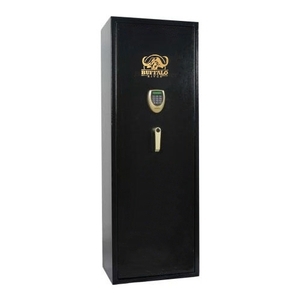 A Buffalo River Safe will provide you the certainty that your firearms are available to only those you allow. The LCD Series features many features that provide you with the series maximum security. Each safe is made of plate steel either folded or total seam welded to the form the body and frame of the safe. The safes are available in various thickness providing increased security up to 6 mm walls and doors. The door construction is designed in a time proven manner that utilises 8 separate bolts to secure the door the ridged frame. These bolts are 25mm or one inch in diameter. They are activated by a central locking control that is activated by a tamper resistant LCD keypad. The LCD Keypad is operated by AA batteries that can be replaced without accessing the Internal safe. All codes are easily programmable by the owner. All LCD safes are also provided with two emergency keys that allow manual access should the LCD be damaged in any way - such as in an attempted break in! Additional replacement LCD units will allow you to get your safe fully operational again. Internally the Safe is fully lined with carpet to protect your valuable firearms from harm when they are being removed or replaced inside. Behind the Carpet on most LCD series is a 10mm fire resistant board that provided fire resistance should the need arise. On Many models an internal lockable cabinet is provided for ammunition or handgun storage as required. Your firearms are held in place by soft rubber mouldings designed to keep the firearms apart without marking the steel or wood. All Buffalo River Safes are supplied with pre-drilled holes for fixing to walls and or floors. We even supply you with the masonry anchor bolts! Buffalo River LCD Safe are available in various sizes and steel thickness.